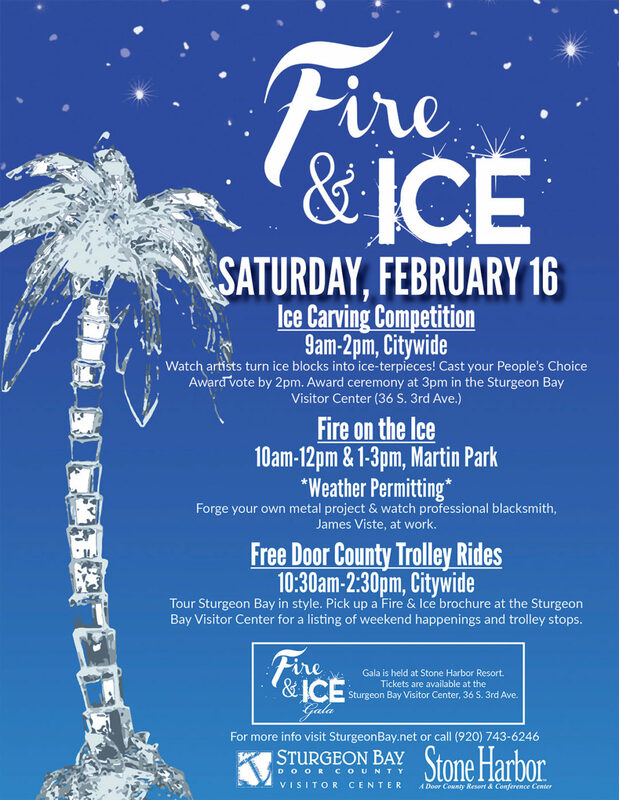 This weekend is the annual Fire & Ice Festival with an Ice Carving Competition going on throughout Sturgeon Bay on Saturday, Feb. 16th! Free Trolley Rides will help you stay warm as you explore the city and watch ice carvings in progress, visit the shops, and enjoy delicious drinks, meals and desserts with your sweetie. 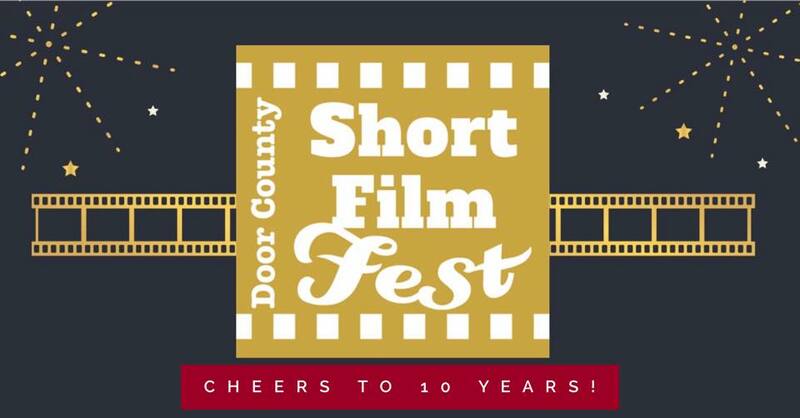 In Sister Bay, the Door County Short Film Festival celebrates their 10th year with $10 Two-Day All-Access Passes + free popcorn! 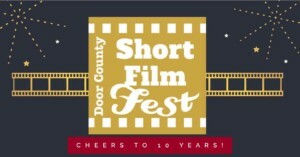 Films from 2 to 20 minutes in length, all produced by amateur and professional movie-makers, will be screened at the Sister Bay Village Hall starting at 7pm on Friday, Feb. 15th and continuing Saturday afternoon with intermissions, and presentations and Q&As with attending filmmakers! 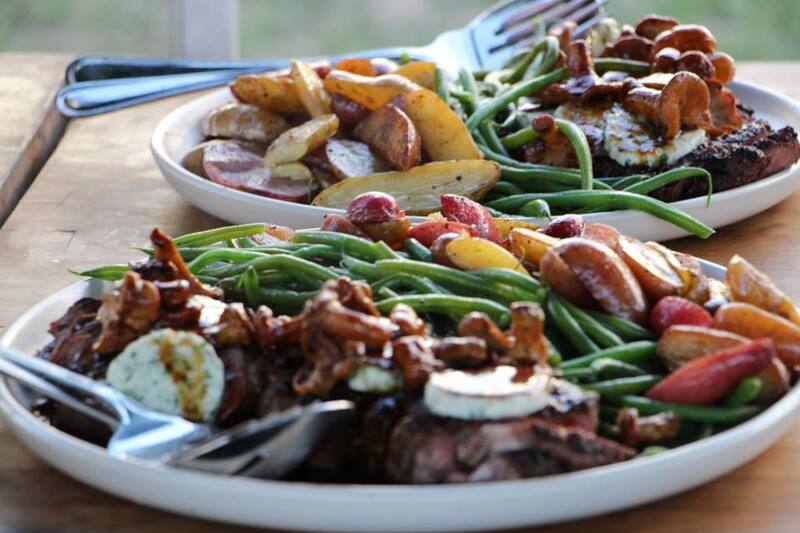 Try the delicious dining options below, and get the FREE Door County Chefs Mobile Dining App on iTunes or GooglePlay to find all the Open-in-Winter restaurants on the Door Peninsula, and use the click-to-call feature to make your reservations! 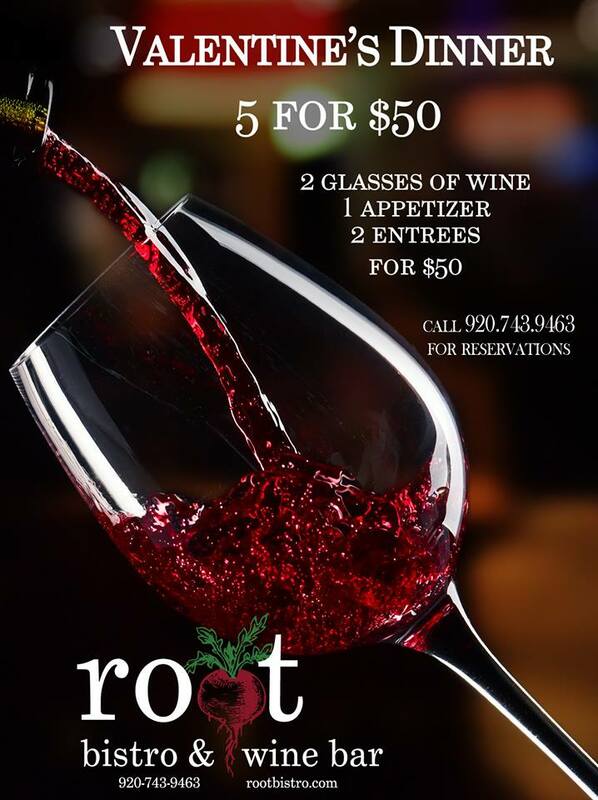 Root Bistro in Sturgeon Bay is the perfect romantic spot to wine and dine your darling this Valentine’s Day with their 5 for $50 Valentine’s Dinner – an appetizer to share, 2 entrees, and 2 glasses of wine! Call for more info and reservations (920) 743-9463. 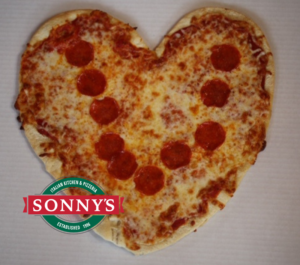 Sonny’s Pizzeria in Sturgeon Bay has a Heart Shaped Pizza for you and your darling to share this Valentine’s Day! If you plan to stay in and chill in town – Sonny’s offers free delivery in Sturgeon Bay so you can get cozy with your honey and stay that way… Call (920) 743-2300 for more information and delivery orders. 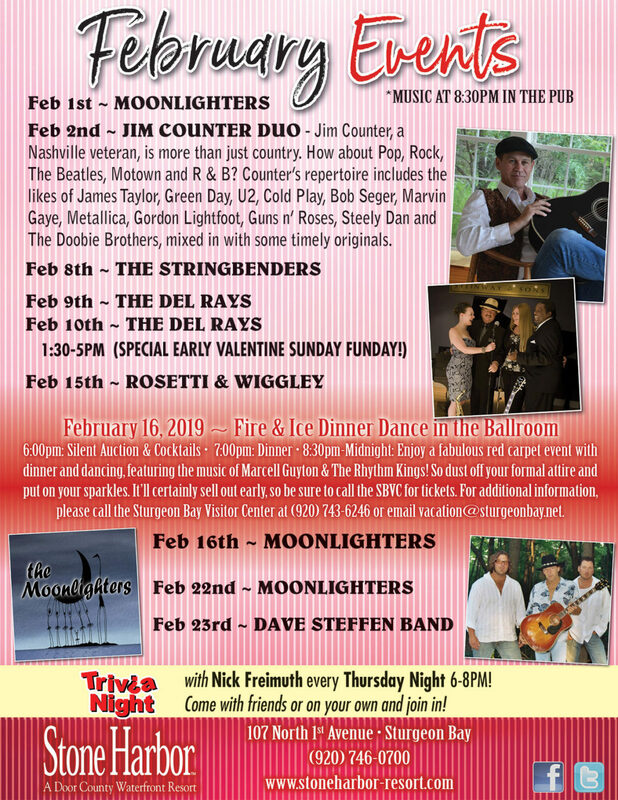 Stone Harbor Resort in Sturgeon Bay has live music with Rosetti & Wiggley in their pub on Friday, Feb. 15th, and the Moonlighers on Saturday, Feb. 16th. Saturday is also the annual Fire & Ice Gala (call the SBVC for remaining ticket availability: 920-743-6246). Rooms are still available for Feb. 14th and the weekend at Stone Harbor with no minimum stay… so book your romantic getaway ASAP! Call for room or dinner reservations: (877) 746-0700. Wickman House in Ellison Bay is your romantic dining destination in northern Door County! Candlelight and creative cocktails, delicious dinners and decadent desserts await you! They will be open from 5-10pm on Wednesday, Feb. 13, on Valentine’s Day, Feb. 14, and Friday, Feb. 15 (their last day until Spring open!). Reservations are welcome, and they will also be taking walk-ins all night at the bar and counter… Call ​(920) 854-3305 for reservations and more information. Friday is Casual Night, No Reservations! The English Inn in Fish Creek will be open at 4pm for Dinner on Valentine’s Day and all weekend, serving their famous Beef Wellington, salads with home-made Hot Bacon Dressing, and lots more! 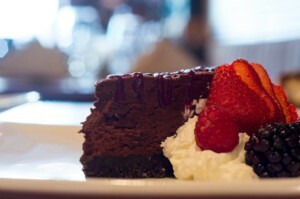 Reservations recommended, please call (920) 868-3076 or request reservations online. Door County Coffee & Tea’s “We Love You” Sale runs through Feb. 14th so you can spoil the Coffee-lover in your life! Get 25% Off all Coffee & Gifts, just shop online and use the code LOVECOFFEE25 at checkout! The café in Carlsville will be open on Valentine’s Day for your breakfast or lunch date with your sweetie! 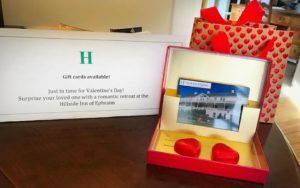 Even if you can’t get to Door County for Valentine’s Day, you can give the gift of a getaway with Gift Certificates to delightful and romantic Inns, B&Bs and more! Hillside of Door County, in Ephraim. White Lace Inn, in Sturgeon Bay. 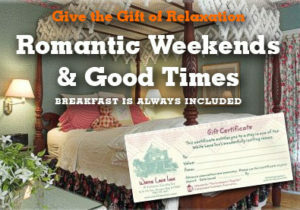 Check out Door County Lodging’s Bed & Breakfasts and get away to the Door Peninsula!